...but no other man helped the city grow as much as John D. Spreckels. One of the sons of the wealthy "Sugar King" Claus Spreckels, who made is fortune off sugar beets and therefore beet sugar, the younger Spreckels left his hometown of San Francisco in the wake of the 1906 earthquake and fires and relocated his family to San Diego. But he'd already been conducting business locally since before the turn of the last century, having bought the Hotel del Coronado, the San Diego Union and Tribune, multiple railways, the Coronado ferry, and Belmont Park. ...and that houses the eponymous theatre that became the first commercial playhouse West of the Mississippi. ...the Spreckels Building rises six stories high and still functions as an office building. ...and the main access point to the offices upstairs. ...and you don't even really realize where exactly you are until you spot the box office on your left. This is The Grand Lobby. ...you face the historic concessions stand, the theatricality of which is unmistakable. ...as he'd also designed his organ pavilion in Balboa Park (also built for the Panama-California Exposition) and his mansion on Coronado Island (now the Glorietta Bay Inn). And that includes the constant reminders of who we have to thank for the lovely building—because you'll find a calligraphy-style "S" on nearly everything. ...and its operator in 1931 converted it into a first-run movie house (with projection booth added). ...and since that time, it's been thriving as a performing arts venue (with the occasional Broadway touring company renting out the house and even bands like Metallica rattling the rafters). While the auditorium was originally built to hold 1915 seats, that number has expanded and contracted over time depending on the type of seats and their configuration. (Case in point: the upper balcony stands, where audience members once sat directly on the risers, though there are seats installed there now). It now seats just under 1500 in the orchestra, mezzanine, and upper balcony sections as well as the opera boxes. The stage, which measures 82' x 58', is supposedly one of the largest ever constructed. Even in the nosebleed seats, the acoustics are crisp and the sightlines are unobstructed. ...and that depict, respectively, Dawn as well as Air, Water, Fire and Earth. Although the theatre underwent a restoration for its centennial in 2012, there's still quite a patina left on its upper reaches, making it difficult to work out the details as you gaze heavenward. Not satisfied with just seeing the theatre itself (or even standing on its huge stage), during my Open House San Diego visit I just had to take the elevator to explore the rest of the Spreckels Building. The original tiled floors continue throughout the upper floors as well, though the walls and much of the rest of the interior appear to have been scrubbed of most other historical traces. But looks may be deceiving—because there are more than a few secrets to this building, some of which perhaps only the ghosts can tell you how to find. 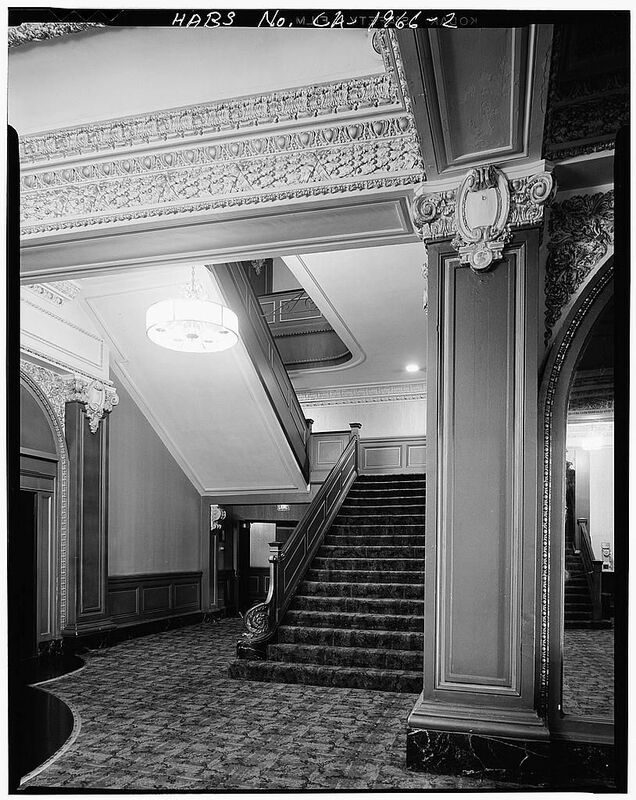 And we know for a fact that there used to be a secret passageway from the theatre into the men's room of the street level restaurant (then known as the Theater Buffet and Bar, now Dobson's). Maybe there still is. Or maybe there's another that hasn't been rediscovered yet.